The Forge archive has its origins in a building of the same name that once stood on Percival Street, Kanturk, Co. Cork. In June 2005 I carried out a desk‐based archaeological assessment and historic building survey at the site. The fieldwork element was to comprise one or two hours of photography and note taking, and an EDM survey of the front elevation. The results were combined with readily available documentary and cartographic evidence and submitted in report form to the client’s developer in order to satisfy a planning condition in advance of demolition of The Forge, and the construction of a new two storey building on the same site. The job was relatively straightforward but my subsequent personal engagement with the building and its contents endures. The Forge was a two storey combined dwelling and smithy of the vernacular tradition built sometime prior to 1842. It was last occupied by Kathy Buckley in the late 1970s, inherited by the client’s late husband in 1982 and, due to a combination of sentimentality and superstition, left relatively untouched until my arrival in 2005. Having concluded my official business I instinctively proceeded, with permission from the client, to document and salvage what I could prior to demolition. My experience at The Forge has led to ongoing multidisciplinary enquiries relating to my behaviour and my chosen subject matter. Subsequent blog posts will serve to publically catalogue, analyse and disseminate the resulting archive and inform additional artistic outputs. A three digit numbering system and three letter prefix (e.g. BFK001) will be applied to the archive contents as an inventory is built. 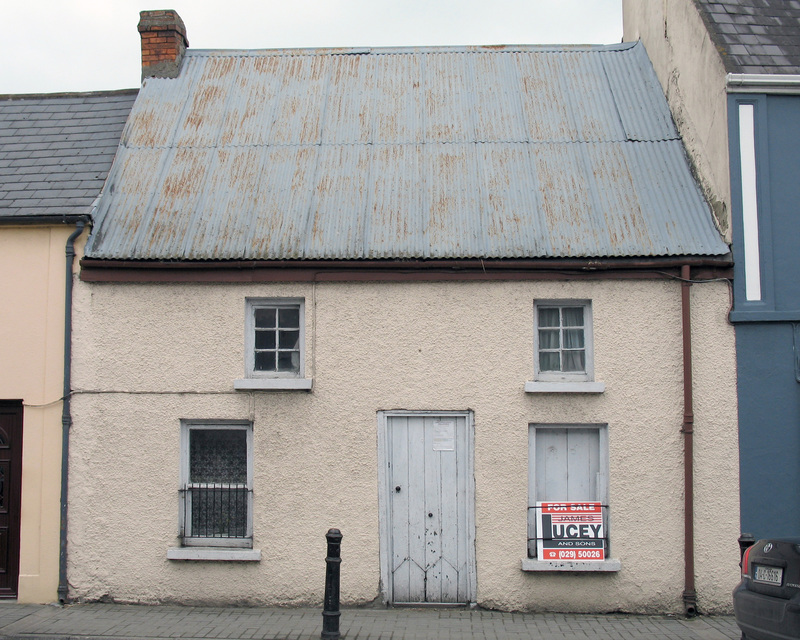 The front (south) elevation of The Forge, Percival Street, Kanturk, County Cork (Photo: Brian Mac Domhnaill, 2005). I will begin by introducing the building. It was rendered and painted at the front with exposed mixed sandstone, limestone and red brick masonry visible to the rear. The previously thatched roofed was covered in corrugated-iron. There was a red brick chimney at the west end of the apex. The asymmetrical façade of the building had a wooden door set slightly to the east of centre flanked by a window on either side. The timber framed sash window to the west of the door, fronting the kitchen, still had its glass intact and there was a iron grill on the outside. The window to the east had wooden shutters and two protective horizontal iron bars. The door and east window fronted the forge. There was one six‐pane timber framed window for each of the two bedrooms on the second floor, each window equidistant on either side of the door below. There was a socket above the front door where the sign for the forge had originally been inserted. 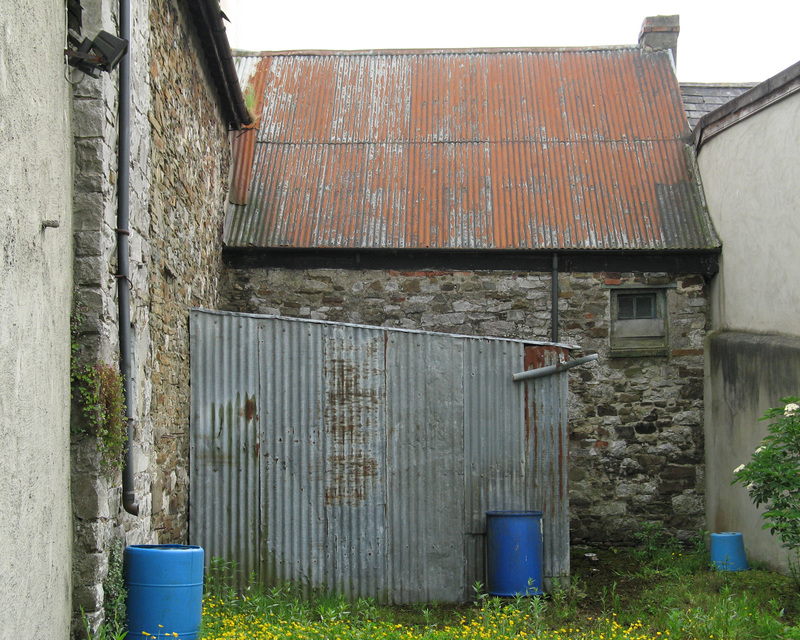 The rear (north) elevation of The Forge, Percival Street, Kanturk, County Cork (Photo: Brian Mac Domhnaill, 2005). A shed to the rear of the building consisted of one east west running wall of corrugated-iron and an east west sloping corrugated-iron roof that abutted the back of the stone building. There were supporting wooden beams slotting into both the back wall and the neighbouring wall to the east. There were two doorways in the back wall of the main building, one to east end that was blocked with a sheet of corrugated iron and a centrally placed opening with a damaged wooden door. The wooden lintel was badly rotted and in a state of collapse causing the displacement of some of the stonework. At the western end of the wall there was a small four paned timber framed window at the top of the wall that lit the landing of the stairwell inside. Internal ground plan compiled from front elevation survey, notes, and photographs (Image: ‘Abandoned houses in Ireland 1780-1980: More than a passing interest’ a lecture by Brian Mac Domhnaill at the Irish Post-Medieval Archaeology Group Conference 2011). Internally the building consisted of a forge and kitchen on the ground floor and two bedrooms on the first floor. Both the door at the front and the two doors at the rear of the building led into the forge. From the forge the kitchen was accessed through a door centrally placed in the partition wall. There was a fireplace in the kitchen on the west wall. The upstairs was accessed by a stairway against the north wall that ran from the west wall upstairs to the dividing wall downstairs. On the east wall of the forge there was a furnace that would have expelled its smoke through one or more of the flues in the chimney on the west gable of the neighbouring building to the east. 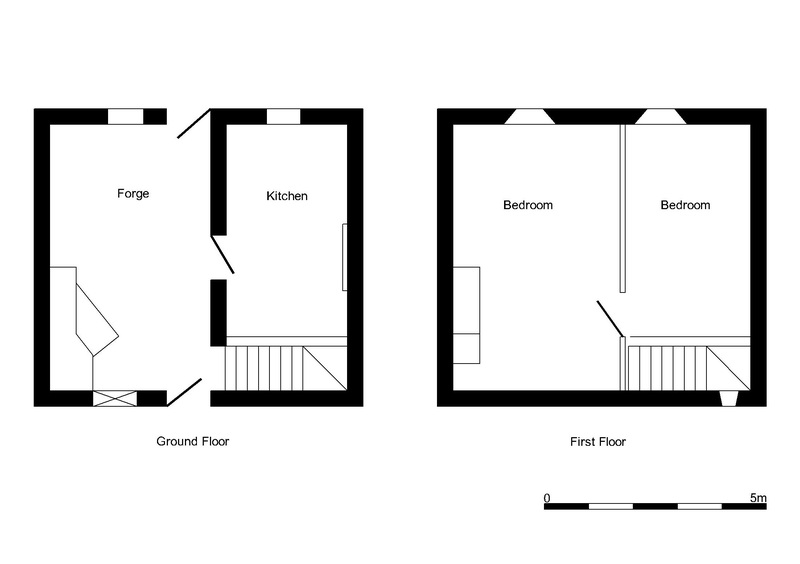 On the first floor the stairs provided direct access to the west bedroom and the east bedroom was accessed through a door in the northern end of a timber north‐south running partition wall. There was a fireplace in the east wall with recesses on either side. The wooden ceiling sloped upwards toward from the top of the walls but became flat before the apex. A single small dormer window in each of the bedrooms allowed daylight in at floor level.